INSPi is a 6-piece a cappella group that sings songs with only human voices, without any instruments. 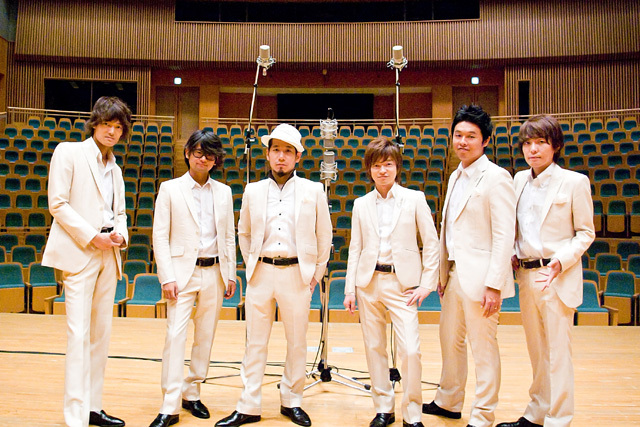 Since their debut in December, 2001, INSPi has held many cappella concerts not only Japan alone, but also overseas such as Indonesia and Thailand. Recently, INSPi held a successful concert in Mongolia, as the very first Japanese music group to hold a solo concert. They also held concerts in Republic of Uzbekistan and Republic of Kazakhstan. In Japan, INSPi has worked together with Kazufumi Miyazawa from THE BOOM, Tsuyoshi Nagabuchi, and many other talented musicians. From February, 2005, they have been singing a famous Japanese commercial song for Hitachi TV advertisement. INSPi is working on a project named “Koetsunagari,” which means connecting people through “voice,” as they collaborate with various chorus groups. Because INSPi does not need any equipment to present their music and can sing wherever and whenever they want, they are actively working for charities, especially after the Tohoku Earthquake. Now, INSPi sings Japanese children’s songs and all-time favorite oldies to make people feel relaxed and comfortable with Japanese heartfelt songs.